Rutgers Chabad honored a supermarket executive at a Hanukka-themed fund-raiser that brought in $1.5 million toward its expansion on College Avenue in New Brunswick. Lt. Gov. Kim Guadagno gamely recited the Shehecheyanu prayer over the Hanukka menora at the event, the annual National Founders Day dinner, held the first night of the holiday, Dec. 20, at the Hyatt Regency in New Brunswick. “I’ve done a lot of interesting things, but this may be the most interesting thing I’ve ever done,” she said, addressing the crowd of 500. Ronald Rak, president and CEO of Saint Peter’s Healthcare System, said it would be donating an apartment at the Rutgers Chabad House on a permanent basis to be used by observant families of patients at nearby St. Peter’s Medical Center on Shabbat and holidays. The evening’s honoree was Richard Saker, president and CEO of Saker ShopRites, who created “Kosher Experience” stores-within-a-store at many of his 30 supermarkets. Chabad executive director Rabbi Yosef Carlebach credited Saker, who is not Jewish, with “creating the prototype” for a greatly expanded kosher market. Carlebach said the relationship with the Saker family goes back 30 years, when he and Saker’s father, George, hatched the idea for “kosher week” at various Saker supermarkets. “At the time, the kosher food was at the end of an aisle somewhere between the Mexican and Oriental products,” said Carlebach. State Sen. Jennifer Beck (R-Dist. 11), whose district covers Monmouth County, where Saker lives, presented a proclamation to the honoree, called him “one of the treasures of our county.” She noted that in the last year alone, more than 1,500 central New Jersey charities had benefitted from Saker ShopRites’ philanthropic donations. 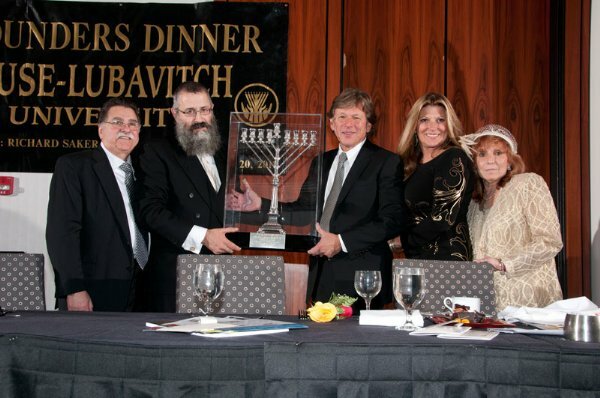 In accepting the award, Saker announced he would add another $100,000 to his pledge to Rutgers Chabad.